NEW YORK ( TheStreet) - Verizon ( VZ - Get Report), the U.S. largest wireless carrier, beat third-quarter earnings estimates, but the stock was down slightly in Friday morning trading. Adjusted profit excluding one-time items rose to 56 cents a share from 52 cents a share last year, and above analysts' estimates of 54 cents. Third-quarter revenue decreased 2.9% from last year to $26.5 billion, but still beat analysts' expectations of $26.3 billion. Despite the popularity of its Droid devices, Verizon has struggled to compete with AT&T ( ATT in the smartphone market which has hurt subscriber growth in its wireless business. Verizon added 997,000 new customers, compared with 1.2 million customers a year before. The company ended the quarter with 93.2 million total subscribers. In comparison, AT&T announced Thursday net adds of 2.6 million subscribers during the quarter. While AT&T has held an exclusive agreement to sell the iPhone since 2007, rumors have surfaced that Verizon may soon sell the device. Verizon will begin selling the iPad on Oct. 28, which some believe signals the beginning of a new relationship with Apple ( APPL. "You can always look at Verizon as the weak sister in terms of Droid versus iPhone, but over time I think Droid will close the gap," said Charlie Smith, principal and CIO at Fort Pitt Capital Group in Pittsburgh, which owns 600,000 shares of Verizon. "I don't think Verizon feels they need to hurry up and get the iPhone on their system, because the penetration they've been getting with the Droid is working well for them." In an attempt to increase smartphone penetration, Verizon announced Thursday it would offer a cheaper data plan for smartphone users beginning next week. "We have a $20 billion annual wireless data business," Verizon CFO John Killian said during an earnings call with analysts. "It's hard to describe that as early innnings, but we still believe its the early innings of the data explosion." Verizon also added 204,000 net new FiOS TV customers, for a total of 3.3 million. The company expects that second-half adjusted EPS will be about 5 percent to 10 percent greater than its first-half earnings of $1.01. 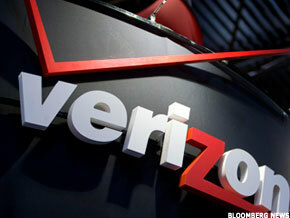 Verizon fell 1.32% Friday morning to around $32.09.